Immigrant Families Together ( www.immigrantfamiliestogether.com) is a movement to help reunite detained parents with their children. With grassroots effort and community donations, we have successfully bonded out Yeni Gonzalez and she's held her kids again ( https://nyti.ms/2lRD7jy)-- there is a long line of moms waiting to do the same. Lilian is the 5th mother we are helping, and is currently detained at an ICE facility in Arizona. Her bond is currently set at $25,000. Her child has been transferred to another state. 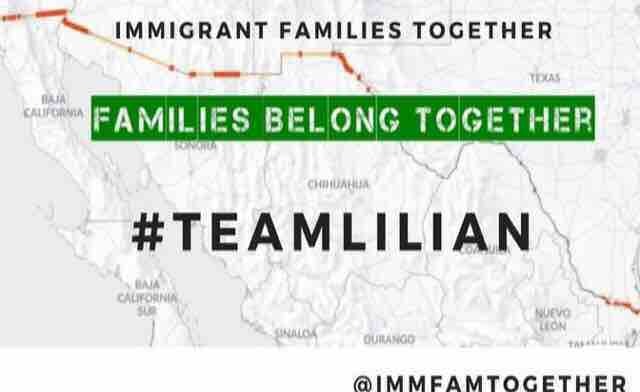 Any funds raised beyond the $50,000 goal (amount for transportation and associated costs for reunification, and sustaining the family while they work through the legal process, and Lilian can’t legally provide for her family for at least 5 months without risking deportation) will be used to reunite other families. El grupo de Familias Inmigrantes Unidas ( www.immigrantfamiliestogether.com) es un movimiento que ayuda a reunir a los padres que han sido separados de sus hijos bajo la politica de cero tolerancia. Con ayuda de la comunidad y sus donaciones, hemos podido ayudar a pagar la fianza de Yeni Gonzalez y gracias a esto Yeni a vuelto a ver y abrazar a sus hijos de nuevo ( https://nyti.ms/2IRD7jy). Desafortunadamente hay una larga fila de padres en su misma situacion esperando reunirse con sus hijos. Lilian es nuestra 5ta mama que estamos tratando de ayudar. En este momento Lilian se encuentra detenida en un centro de detencion inmigratoria en Eloy Arizona. Su fianza es de $25,000 dlls. Su hijo ha sido transferido a otro estado. Lilian PUEDE ser reunida con su hijo si todos ayudamos, trabajando en conjunto con su abogado. 1. Reuniendo fondos con donaciones para pagar sus fianzas. 2. Pagar fianza, y proveer asesoría legal para cumplir con todos los requisitos legales necesarios mientras esperan ser reunidos con su hijos. 3. Organizamos el transporte desde el centro de detención a el estado donde se encuentran sus hijos. 4. Cuando necesario, buscamos alojamiento para los padres mientras esperan su juicio legal. 5. Conectamos a los padres con recursos locales que puedan ayudarlos a sustentarlos mientras esperan el ser reunidos con sus hijos. Se utilizaran para pagar todos los gastos necesarios para pagar la fianza, el transporte, alojamiento, comida, telefono cellular y otros gastos basicos. Ademas de ayudar economicamente cuando sea reunida con sus hijos. No tenemos relacion de sangre con Lilian o con su abogado. Somos una comunidad de padres preocupados que no apoyamos la poliza de separar familias al cruzar la frontera. Los fondos seran retirados por la fundadora de Familias Inmigrantes Reunidas Julie Schwietert Collazo. Los fondos seran transferidos a el abogado de Lilian. Los gastos a pagar incluyen: gastos relacionados a su liberacion, transporte de Eloy Az, alojamiento, alimiento, transporte local, celular y otros gastos necesarios para la reunion de Lilian con sus hijos. Ademas de pagar gastos legales para la preparacion de su caso ante el juez. Thank you, again, for your generous donations and contributing to changing this family’s life. On some rare occasions, there is nothing better than being wrong. This is one of them. We’re beyond thrilled to report that Lilian DOES have custody of her son, as of today! After not knowing his whereabouts since May, she not only got to hold him today, but got to take him home. For the first time in months, she will go to sleep not only knowing where he is, but under the same roof. There are not words that express enough gratitude to you all, and the magnitude of what you’ve done for this family can’t be overstated - an enormous, deep, and resounding thanks to every one of you. Due to your support, generosity, and open hearts, today Lilian saw her son for the first time since May. He is now in foster care so Lilian has not regained full custody yet, but considering that a few days ago she didn’t even know where we was, the fact that he was in her arms today is nothing short of a miracle. You can read more about their story (and see video of their reunion) at the link below, but just know that you did this. In the future, whenever you encounter darkness in the world or begin to doubt the good in humanity, think back to the beautiful thing you’ve done for this family, as a reminder of the mountains we can move if we work together, and with love. Thank you all so very, very much. Lilian was bonded out today! This means she will be en route to her family shortly. We are thrilled. Remember-- this is just the beginning. We have more and more families waiting for our help. Our joy-- at positive change-- and our rage-- at the fact that this is happening in the first place, and all the ugly complications for these families that have ensued-- continue to flow. Please keep spreading the word-- the road to reunification is long.